Presentation is paramount in the world of design; I’ve been studying Interior Design long enough to know that presentation boards are a vital communication tool. I also know that it’s quite challenging to think of different and creative ways to convey your message when you’ve been staring at a blank A3 template for what feels like hours. I use MS PowerPoint when producing my boards, but what if you combined PowerPoint with Google Sketchup and Maxwell Render? 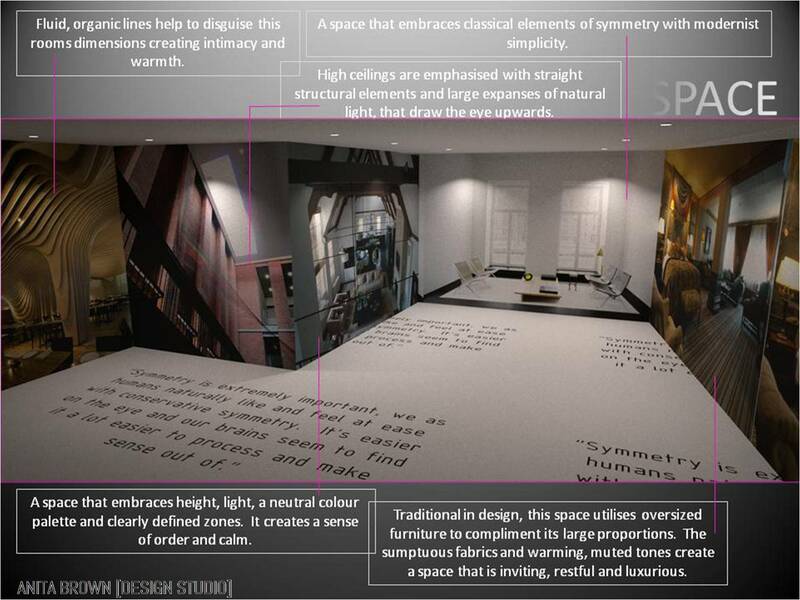 Hmmmm… For this board I was required to illustrate my understanding of ‘space’ in interior design terms. The design of the board had to reflect the subject. After a ‘light bulb’ moment, I decided to present my images as though they were projected onto walls within a ‘space’ and I used a quote from a design company I had previously interviewed in a more creative way. It certainly makes a change from the more traditional method of image placement, that’s for sure.